on the last day of the year Dec. 31, 2018. 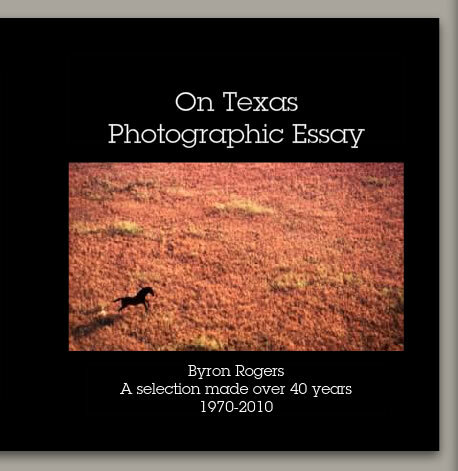 On Texas Photographic Essay – A Selection made over 40 years – 1970-2010 are signed hardback books sized at 8 x 8 inches in a limited edition of 20. Each Byron Rogers new book of Texas photographs is signed by Byron in acid-free ink and numbered 1 of 20 — 2 of 20 — 3 of 20 — 4 of 20 — 5 of 20 — ect. The price for the last two is $39.95 each and will go up in price on the next two books and so on until all are sold. See pricing of the edition below. Byron will never make the same book in the same size with only this selection of images ever again. This book is the first book I have made since 1971. To see a selection of the images inside the book go to On-Texas.com. Byron was showing his artist working proof to people and they asked if the book was available for sale. This is how the limited edition of 20 came about. Buy now before the price increase Dec. 31, 2018! All of the books printed in the United States of America. Each book includes a separate short Introduction and a Certificate of Authenticity. Add $7.95 shipping (USPS Priority Mail) for the first book ordered and add $1.00 more for each additional book ordered at the same time up to 4 copies. If you want more than 4 at one time call us for shipping price. Shipping is available in the USA using a USPS Priority Mail 9X12 inch padded heavy duty envelope. To order send an email or call with the number of the edition of 20 you wish to purchase along with your Zip Code and I will send an invoice from PayPal to you with the total. Or print out the order from here and mail us a check. I will update this page as they sale. You only need to pay tax if you order from Texas.